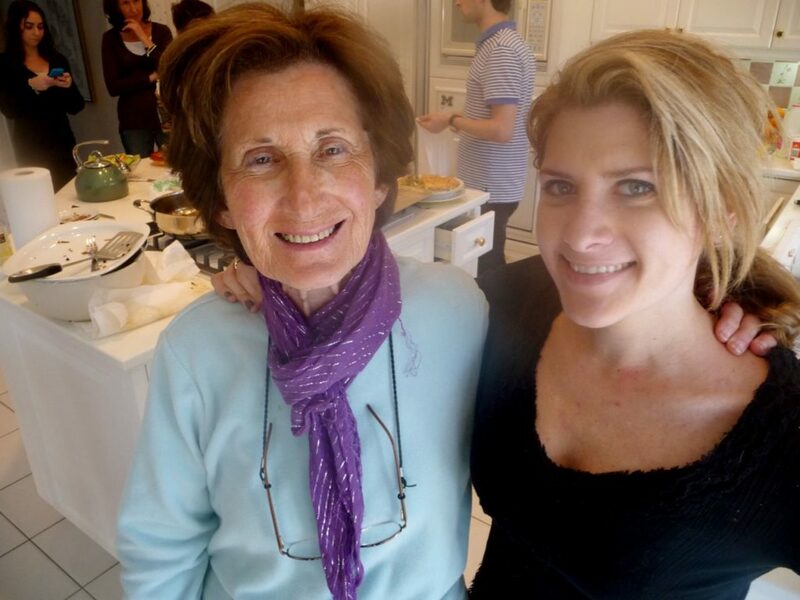 By far I am asked the most questions from readers about Bubbe- who is this sassy lady who inspires my recipes and leaves witty comments to boot? I finally got around to interviewing my fave maj jong connoisseur when I was home for Hanukkah. 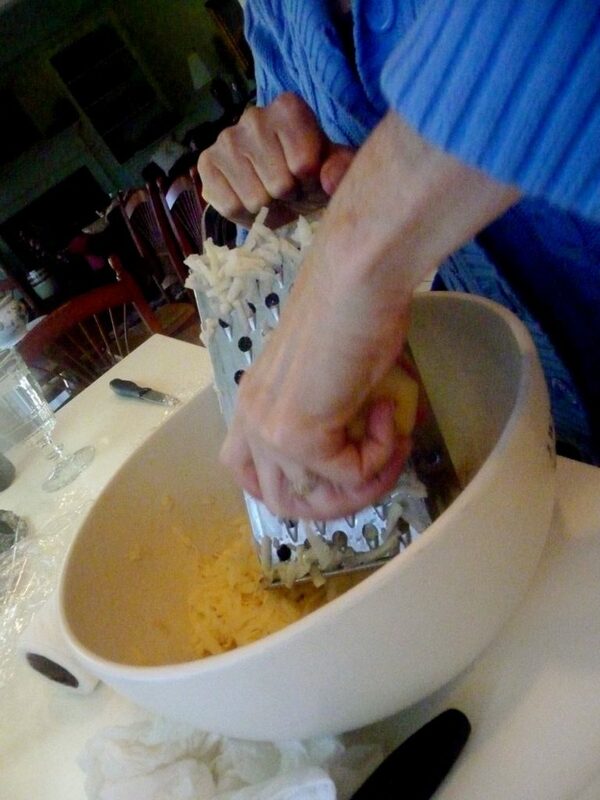 Bubbe saw my Mexican potato latke post and my lack of a proper grater gifted me this awesome grater that was her mom’s- my great bubbe! And it is in perfect condition. How cool is that? So very cool. I used it to make these tasty latkes- so pretty! My fam loved them. Here is my brother adding the cilantro filled sour cream! 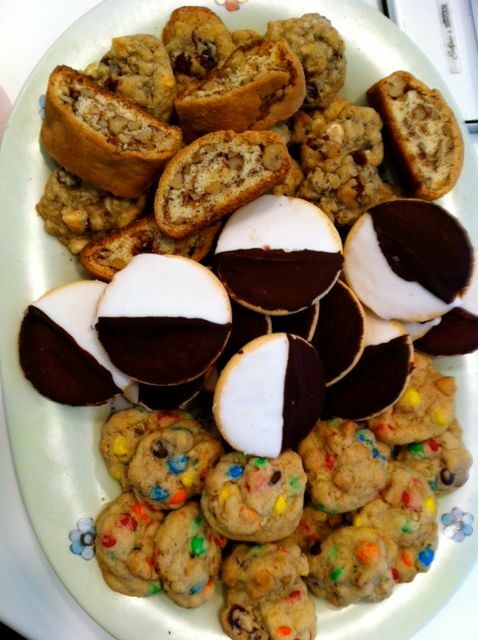 And my Mom made one of her killer signature cookie trays with mandel bread, black and white cookies and M&M cookies! Now on to the interview! Hope you enjoy. Thanks for letting me interview you for WJWE, Bubbe! Inquiring minds want to know. What are your favorite foods? Growing up I didn’t like Jewish food at all! I didn’t like gefilte fish or even chicken soup. I would smell it every Friday and just couldn’t stand it. But now I love it! I love tzimmes and love love latkes! 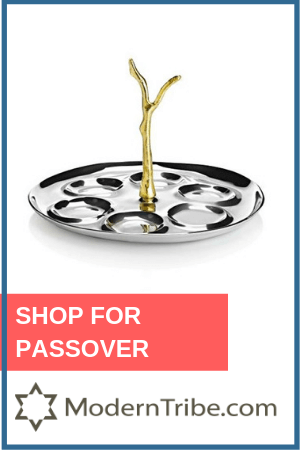 Especially your Mexican latkes. 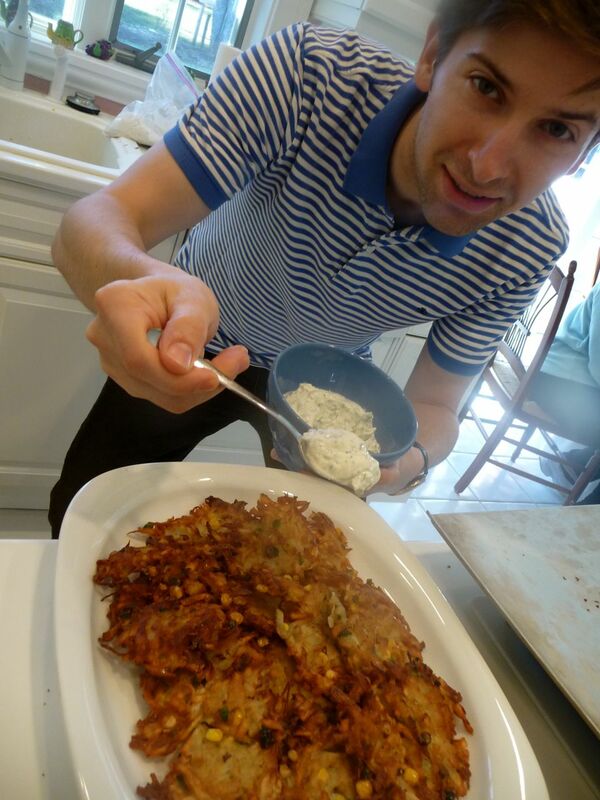 I would hop a plane to Texas just to get a Mexican latke- yes I would! Besides Jewish food I love fried flounder, veal Parmesan, eggplant Parmesan and hamburgers. And mashed potatoes- I love mashed potatoes! And chocolate pudding- not the instant- with sweet cream. Great! I make a mean truffle mashed potato I will have to make for you. Where did you grow up? What are you earliest cooking memories? I grew up outside of Boston in Malden, Mass. Every Friday was the same smell- chicken soup, chicken or meatloaf and potatoes. Or pot roast- roosl-flaysh in Yiddish is what we called it. That was my mother’s specialty. Every day she would go to the kosher butcher to buy the meat- they didn’t have a freezer back then or anything! My father’s mother was a real tyrant- she was terrible. By my mother’s mother was so easy going- just like my mother. She had two husbands- not at the same time of course- and had a bakery. My mother had four sisters and one brother and every morning at 4 AM they would deliver challah in the snow or in the cold. Every morning! No matter what. But I was six when my maternal grandmother died so I do not remember too much about her cooking and baking. What dishes of your Mom’s do you miss? My mother made the best cheese blintzes, sometimes blueberries. She used to do it with two frying pans and made a whole bunch and spread them all over the entire kitchen to fill and assemble! What a site to see! Neat-o! What recipe would you like to see on WJWE? Kishke- stuffed derma. It’s an intestine stuffed with potato kugel filling. It is absolutely delicious! But it’s very hard to do. And I like kasha varnishkas- that’s easy! And sweet and sour tongue, but forget that! Eck! It all sounds delish. 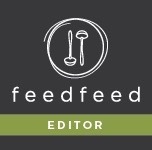 What are your favorite recipes to cook? Oh jeez! At my age who cooks? Sweet and sour meatballs, spinach squares, matzah ball and chicken soup, pot roast, fish and breaded chicken. I made breaded chicken a lot for your mother growing up- it was so good! Oh and I made a challah stuffing for Thanksgiving this year that was to die for! Yum! I’ll have to make that next year for sure. Did you always encourage your kids and grand kindelah to be creative in the kitchen? Of course! 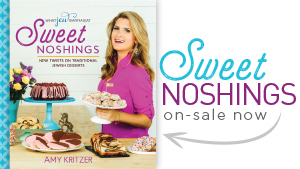 Your mother became quite the baker when she was in high school- cookies and ice cream cakes. And she loved a pretty presentation. Just like Jew! Ha- good one! What words of advice do you have for WJWE readers? 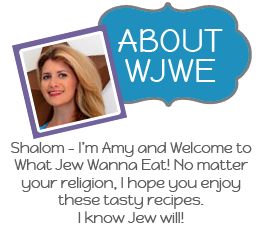 Try all the recipes on WJWE because you can’t fail! Each and every one is better than the next. Yeah! I’m kvelling! Aw, thanks, Bubbe! Anything else you want to add? I am so proud of my little girl and I just love you! That’s all! Thanks, Bubbe! I love you too. Great how you can share food memories like that. Love the interview. It took a LONG time, but I have “made it to the top,” Thanks to my WJWE doll!!! Thanks, Bubbe! Love you too! Great interview. You are lucky to have a bubbe so computer savy and just plain savy and just plain alive!! 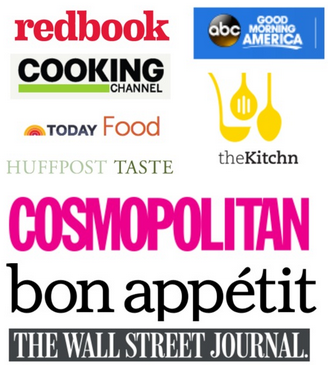 Would love to try the challah stuffing…I think it is on your blog somewhere? Thanks, Gloria! I am super lucky to have Bubbe- and she knows it!! I don’t know the challah stuffing on my blog actually, but I will definitely have to make it! I don’t think I can wait until Thanksgiving either. I thoroughly enjoyed this interview, in fact, have tears in my eyes. So much of how she responded to you were the same conversations, the same words I’ve had a million times with my own family. And yes, she’s funny. And she loves you just like any card-carrying bubbe. Oh man, it must be fun to eat at your and your families’ house. I just found you, Amy, via the Daily Candy contest you’re a finalist for (yes, of course I’m voting for you!). I’ve been a vegetarian for awhile now but just ramped it up eliminating dairy and all oil from my diet. So, my job is to choose your recipes that come closest to how I can eat and modify where necessary. On the top of the list is baked falafal and pumpkin hummus. If I don’t brush the falafal with oil before it goes in the oven, how do you think it will turn out? Aw thanks, Robin! I try to make vegetarian recipes every now and again, or at least ones that can be modified. I think the falafel would still turn out great without the oil!